England’s best synchronised swimmers will be performing their new routines for fans of the sport ahead of this summer’s World and European Junior Championships. 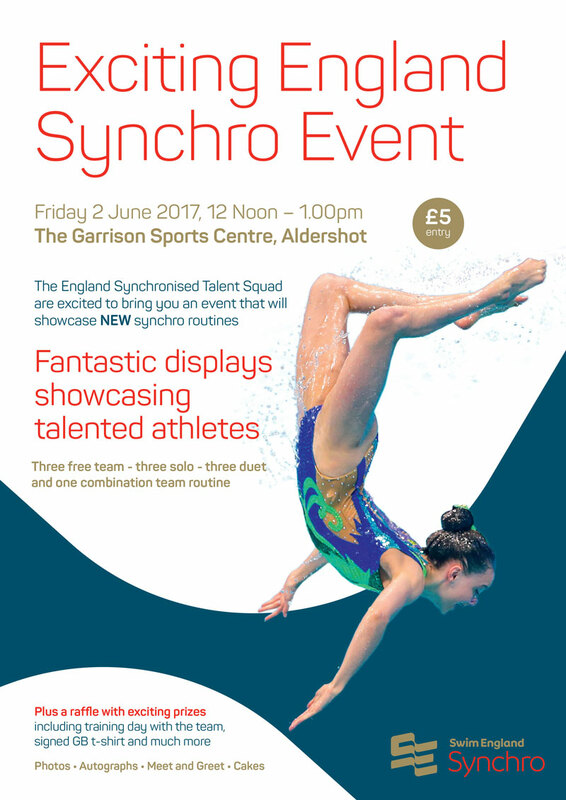 The Swim England Synchro Talent squad will perform 10 routines at the event, taking place at the Garrison Sports Centre in Aldershot on Friday 2 June. The British team will head to Serbia to compete in the European Junior Championships later in June. Kate Shortman and Isabelle Thorpe will also go on to compete at their first senior World Championships in Budapest later in the year. You can see three Free Team routines as well as three Solo, three Duet and a Free Combination performance. The event will feature an opportunity to get autographs and pictures with the some of the top swimmers in the team at a ‘Meet and Greet’ session. There will also be a raffle with exciting prizes such as a training day with the team and a signed GB t-shirt. The event will cost £5 for entry and take place between 12 Noon and 1:00 PM. Contact Swim England Synchro Talent Manager Karen Thorpe at karen.thorpe@swimming.org with any questions about the day.